During March 2015, both foreclosure filings and foreclosure sales were down, year over year, and both remained near all-time lows. 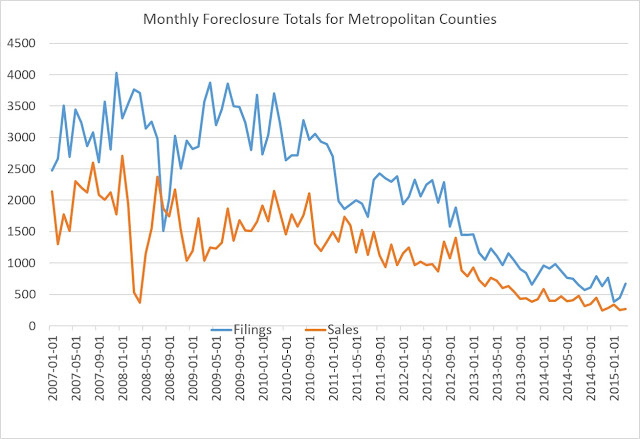 March 2015 foreclosure filings were down 31.4 percent from March 2014, dropping from 981 to 673, year over year. March 2015 foreclosure sales (completed foreclosures) were down compared to March 2014 with a decrease of 32.9 percent, dropping from 404 to 271, year over year. Filings rose 50.2 percent from February 2015 to March 2015, and auction sales were up 7.1 percent over the same period. For the first three months of 2015 as a whole, foreclosure filings were down 47.2 percent, compared to the same period of last year. Filings fell from 2,852 for the first three months of 2014 to 1,505 during the same period of 2015. Foreclosure sales were also down during the same period: sales fell 38.0 percent from 1,390 to 862.